Results: 1 to 10 of a total of 168 results. unique (at least I think so) multi media old school artist. Artist with a big heart I'm pop art artist dedicated to my work but... also very alone in this cold part of the country. So I need some warm up! Does lostinfl belong in this group? Does jacques898 belong in this group? Does naiad77 belong in this group? Alt Celtic F Artist Illustrator/ Graphic designer/ Animator/ Professional freelance multimedia artist/ Model/ Ect.. I am an artist who is passionate about my work and collaborating with others. I always enjoy learning new things and expanding my horizons. My other passions are film, music, travel, anime, manga, manhwa, sewing, and learning about other cultures. Does konaa belong in this group? Does noblegamedev belong in this group? 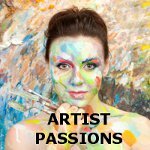 Does creativevida belong in this group?